Lavender flower water is the water that remains after producing a lavender essential oil via steam or water distillation. Lavender flower water is also knows as lavender hydrosol. Their properties are similar to those of essential oils, however since they are far less concentrated there is no need to add them to water before using them in a mister or clothes. Beside lavender, orange blossom water and rosewater are also famous hydrosol and have been used for centuries as ingredients in perfumes and foods, as well as for medicinal reasons. How To Make Lavender Floral Water as a cologne ? You can make lavender water by mixing 15 ml of lavender oil with 375 ml of alcohol and a drop of musk oil. The mixture is placed in an airtight jar, shaken every few days for 2 weeks then strained through muslin into a small perfume bottles. To enhance the appearance of the lavender water, place sprigs of fresh lavender upright in the bottle. Lavender water, a solution of the essential oil in alcohol with other added scents, is used in a variety of toilet preparations. Please bear in mind that these lavender floral water can not be used in cooking. Another way to make lavender water without the alcohol. 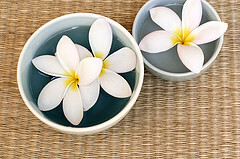 If you want to use floral water for daily use at your home you can try these simple recipes. Making your own aromatic waters is cost effective and much more fun. Flower water is also good for cleaning your face at the end of the day. This simple recipe doesn't take much time. You gonna love it! Boiled 250 ml water for 5-10 minutes, Add 2 teaspoon of dried lavender flower, add 20 drops of essential oils. Mix well. Filter water in a large ceramic bowl. Wait until it cools then pour the water to a jar and close tightly. Keep it refrigerated for later use. Once you have finished mix all the ingredients and the temperature is still warm, you can inhale the steam to clear your sinus. After that, you can make a compress for your face with a cotton. Leave it on your face for 10-15 minutes. In a mild temperature, you can rinse your face and massage the skin with it. It will tighten the pores and reduce any minor or redness. Chilled lavender flower water can be used as a skin freshener. Spritz the face with it and make sure to keep the eyes closed. Shake well before use. You can use it for your hair to nourish the hair and make it soft and shiny. Too busy to make your own? Try these Organic Lavender Flower Water! Lavender flower water is one of the oldest fragrances of European culture. It is nice for sprinkling on sheets, especially for those with insomnia, and on clothes when you know you are going to face an especially trying day. Besides sprinkling on your linens or pillow you can also sprinkle it on your towel or use it as a room sprayer. To make a lavender bed linen mist. Take 200 ml mineral water and add 10 drops of lavender essential oils. Put it in a sprayer bottle. Shake well before use. Making your homemade lavender linen spray is cheaper than buying a commercial product, and it is very easy to do. Simply add lavender essential oils to unscented lines spray, shake well and spritz away. You can spritz your Bedding, spritz your Dresser Drawers, Closets, your towels, or feel free to even spritz the air!! You can add no more than 12 drops per two ounces of product. Adding essential oils to the Linen Spray may make the finished product appear cloudy. This cloudy reaction is normal with some essential oils.